The name of the Winner business has changed but it still offers exceptional, quality and professional care to its patients. Hearing Health Services is the new name of the business and is owned by Lenna Thieman of Colome who purchased the business on Sept. 18. Desirae Vobr remains as the licensed audiologist. The business was formerly known as Hearing Health Center and was owned by Paul Nelson and Catherine Grange of Spencer, Iowa. Vobr has been the audiologist in Winner for 13 years. The business is located at 417 Main St. The business is open Tuesday, Wednesday and Thursday from 8 a.m. to 4 p.m., Friday by appointment only and outreach. Vobr is a 1998 graduate of Colome High School. She received her bachelor’s degree in communication disorders and her master’s in audiology from the University of South Dakota. Vobr obtained her certificate of clinical competency in audiology from the American Speech-Language Hearing Association and is a member of the South Dakota Association of Hearing Health Professionals. 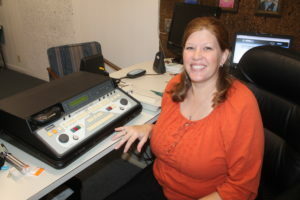 Vobr began taking courses in college for speech pathology. After completing a class on hearing, she realized that helping people hear better was really what she passionate about. While in college, she did an internship at the VA center and School for the Deaf in Sioux Falls. She started working at Sioux Falls Hearing Aid Service with the Nelson group. They are the same family who had owned the Winner business. After and year and a half in Sioux Falls, Desirae and her husband decided to move back to their hometown of Colome. In December 2005, Vobr started working in Winner. As an audiologist, she tests person’s hearing to see where their hearing loss is at and whether they are a candidate for hearing aids. She sells hearing aids and does all the adjustments. Vobr explained over 85 percent are over the 65 age level. However, she is seeing more younger people and believes this is mainly due to their exposure to a high noise level. The hearing test takes about 20 minutes but she allows an hour for the patient. “I love how flexible hearing aids have become and how I can adjust the aids as my patients’ needs change,” she said. Patients appreciate the time that Desirae takes to educate them about their hearing loss and discuss what treatment options would work best for them. “I love seeing people’s faces when they are amazed at what the have been missing out,” she added. Desirae has three children: Eli, 12; Rayma, 9 ½ and Kyler, 7 ½ and is expecting a baby in November. To make an appointment for a hearing evaluation persons can call 842-1209.